After the execution of Charles I in January 1649, Scotland entered a period of complex political maneuvering. His son was immediately proclaimed as Charles II in Edinburgh, though it was soon to be made clear to him that if he were ever to exercise real power he would be obliged to subscribe to a radical Presbyterian agenda. Amongst other things he would be required to take the Covenants of 1638 and 1643, a move his father had always resisted. In exile at the Hague, Charles was anxious to take the quickest way back to the throne. He initially favoured calling on the assistance of the Catholic Irish authorities at Kilkenny, until this option was removed by Oliver Cromwell in the summer of 1649. In falling back on the Covenanters Charles hoped to put them in a more accommodating frame of mind. One way of doing this was to take the advice of the ultra-royalist James Graham, 1st Marquess of Montrose, who had led a military campaign against the Covenanters in 1644 and 1645, enjoying some notable successes. On 22 February 1649 Charles appointed Montrose as Lieutenant-Governor of Scotland and Captain General of all of his forces there. Although he was about to receive a deputation from the government in Edinburgh he was prepared to listen to Montrose's more militant advice, especially as there were already some stirrings against the Covenanters in northern Scotland. Throughout the course of the year Montrose kept busy using his commission in an attempt to raise troops and money in the German state of Brandenburg, as well as Sweden and Denmark. This met with limited success; but by September he had managed to raise and equip a small force of 80 officers and 100 Danish soldiers. Under the leadership of the Earl of Kinnoul these men were sent as an advance party to occupy the Orkney Isles, charged with recruiting local forces, while Montrose remained on the Continent employing professional troops. In March 1650 Montrose came in person, landing at Kirkwall with some more foreign mercenaries to join his advance party and the Orcadian levies. Amongst his officers was Sir John Hurry, his old opponent at the Battle of Auldearn in 1645. Altogether he had 40 horse, 500 mercenaries and 700 Orcadians, completely unskilled in the arts of war. On board his ship, the Herderinnan, anchored in Scapa Flow, Montrose issued his orders to Hurry at a conference on 9 April. He was instructed to cross to Caithness that same evening with part of the little army and advance to Ord of Caithness, a high hill overhanging the sea just north of Kildonan. Montrose crossed with the rest of his force a few days later. Montrose had heard that the local Highland Scottish clans of Clan Munro, Clan Ross and Clan Mackenzie, were up in arms and were likely to join him, although as it turned out, they did not. Montrose had hoped to meet up with the Clan Munro and Clan Ross, but when none of them arrived he pressed on the Strathoikell and into the narrow valley of Carbisdale. For two days he waited in the valley for the Munros and Rosses, but waiting for them was his biggest mistake as the clans had sided with the Scottish Covenanter Government, and Argyll had already set his counter plans in operation. In Edinburgh the Committee of Estates, the executive authority of the Scottish Parliament, was soon aware that Montrose had crossed to the mainland. General David Leslie, Lord Newark was instructed to take his forces north to prevent this incursion from developing into a major rising. A rendezvous was held at Brechin on 25 April. From here Colonel Archibald Strachan was sent ahead to gather the cavalry that had wintered in the north. He now had five troops of horse under his command, including three that had been with him at the rout of an anti-Covenanter army at Balvenie Castle near Dufftown in May 1649. This episode, known as the 'Bourd of Balvenie', convinced Strachan and the more extreme Covenanters that all that was needed to disperse the mighty was a small band of righteous men, after the example of Gideon in the Book of Judges. Strachan now rode on to Ross-shire, convinced that victory was already his. Montrose joined Hurry at the Ord of Caithness. From here their combined force advanced along the coast to Dunrobin Castle, garrisoned for the government by the tenants of the Earl of Sutherland, as were the smaller fortresses at Skelbo Castle, Skibo Castle and Dornoch Castle. Avoiding these obstacles, the royalists turned aside, marching up Strathfleet towards Strathoykell. The Oykell was forded just to the west of its junction with the Cassley, and the trek continued along the southern bank. Montrose had counted on the support of the Mackenzies, but their chief, the Earl of Seaforth, was in exile, and even his brother, Sir Thomas Mackenzie of Pluscardine, who led the rising the previous year, remained quiet. With no support in the hills the rebels continued back towards the coastal plain, halting at Carbisdale on the southern side of the Kyle of Sutherland on 27 April. By now Strachan was at Tain conferring with the earl of Sutherland. Learning of Montrose's whereabouts, he decided on an immediate surprise attack. Montrose's army was in a narrow glen, where the Culrain Burn flows into the Kyle of Sutherland. To his rear the ground rose up to the wooded hill of Creag a' Choineachan. With a good view of the surrounding countryside he would be able to deploy his men on the hill if subject to a sudden attack. Yet, believing there was only a small body of enemy horse in the area, he failed to carry out a thorough reconnaissance, thus making the same mistake that led to the disaster at the Battle of Philiphaugh. Strachan had now reached Wester Fern to the south-east of Carbisdale. On his onward march he still had the River Carron to cross by a ford which left him some miles short of the enemy position. A direct approach would only alert the royalists to his position. Fortunately, much of the way was covered by thick broom, which ended just before the Culrain Burn was reached. Close to the Burn, Strachan concealed his men in a gully overshadowed by broom, allowing only a single troop to emerge into the open. Montrose sent his cavalry under Major John Lisle to investigate, while the infantry took cover in the woods of Creag a' Choineachan. Before these deployments were complete Strachan's whole force emerged and charged. Lisle was immediately overwhelmed, as the Covenanters rode on towards the infantry. The Germans and Danes, seeing their cavalry defeated, retreated into nearby Scroggie Wood. On the nearby hills to the west, according to Wedgwood, the Munros and Rosses were gathering with promises to join Montrose and that if they had come to Montroses help that they could have redeemed the initial disaster. However, instead they joined the attack on Montrose as they believed in backing the winner, and were eager to grab their share of any plunder. The Germans and Danes fought gallantly, retreating deeper and deeper into the wood, but they were losing the battle. The need for self-preservation took over and those that were left attempted to flee, with the bloodshed in the wood continuing for over two hours. 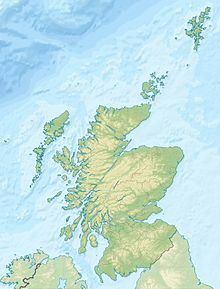 Even after the battle ended the slaughter did not cease; the clansmen of Ross-shire and Sutherland for many days after continued pursuing and killing those who had escaped the battle. Hurry and some of the Danish and German musketeers attempted to make a stand, but the Orcadians crumbled in panic. Two hundred of them were drowned trying to escape across the waters of the Kyle of Sutherland. In a matter of minutes the whole affair was over. Carbisdale was not a battle: it was a rout. The defeated soldiers were hunted over the slopes of Creag a' Choineachan by Strachan's troopers and local hostile clansmen for two hours. Four hundred were killed, and over four hundred and fifty taken prisoner, including Sir John Hurry, whose amazing career as a soldier was shortly to come to an end. Colonel Strachan's scout had been Monro of Lemlair while Montrose's scout had been Robert Monro of Achness. Historians have speculated whether Monro of Achness had lured Montrose into a trap by giving him false information. Despite his wounds Montrose managed to escape from the debacle at Carbisdale with help from Major Sinclair. For some days he managed to avoid capture, disguised as a shepherd, until he finally made it to Ardvreck Castle, seat of MacLeod of Assynt. There is a strong tradition that MacLeod had served with Montrose at the siege of Inverness in 1645 and Montrose would have gone there expecting a place of refuge. However, when Montrose arrived MacLeod was away and he was met instead by MacLeod's wife, Christian Monro, daughter of Monro of Lemlair who had fought on the opposite side at Carbisdale. Montrose was confined in the vaulted cellars of the castle along with Sinclair, who had been found wandering in the hills. MacLeod took credit for the capture of Montrose. Montrose was taken to Edinburgh where he was hanged on 21 May. After execution his body was dismembered, the quarters were publicly displayed in Aberdeen, Glasgow, Perth and Stirling and the head on the Tolbooth in Edinburgh, where it remained for eleven years. With all options now exhausted Charles took the Covenants, against his conscience and judgement. He arrived in Scotland that summer. Unfortunately for him so did Cromwell. ^ a b c d e f g h i j k l m n o 1st Marquis of Montrose Society - Battle of Carbisdale Retrieved 05 August, 2013. ^ a b c Wedgwood. C. V. (1998). Montrose. pp. 138 - 140. Sutton Publishing Limited, Gloucester. Cavendish, Richard (2000). The Execution of Montrose. 50. History Today. Cown, E., Montrose-For Covenant and King, 1995. Hewison, J. K. The Covenanters, 1913. Hutton, R., Charles the Second, King of England, Scotland and Ireland, 1989. Napier, M., Memoirs of the Marquis of Montrose, 1852. Reid, S., The Campaigns of Montrose, 1990. Stevenson, D., Revolution and Counter-Revolution in Scotland, 1644-1651, 1977. Historic Environment Scotland. "Battle of Carbisdale (BTL19)".